Why isn’t my website appearing on Google, I hear you cry. This is the number one question I hear over and over again by entrepreneurs who have just set up their first eCommerce website on platforms like Shopify and WooCommerce. Well, guess what, there are ways to rank above big brands like Amazon . Before I show you how to rank above big brands like Amazon – whether your website is 2 months old or 2 years old – I first need to explain some basic concepts. Domain Authority (DA) was developed by a company called Moz, that predicts how well a website will rank on search engine result pages (SERP). Domain Authority scores range from one to 100, with higher scores corresponding to a greater ability to rank. As a starting business, you would want to aim for 20. From the research that I’ve done, Moz updates their DA Database every couple of months so don’t be upset if your efforts don’t affect your score straight away. Ranking factors for DA fall out of the scope of this document but you can easily find answers to this at Moz.com. In order to take advantage of researching DA, you will need to have a copy of Google Chrome and install the MozBar Extension from the Apps Store then sign up for a free account at Moz.com. You will often see the term SERPs whenever you Google anything about Search Engine Optimisation. This term refers to Search Engine Results Pages and refers to all search engines – not just Google. What are the different types Keywords? There are actually several types of keywords, with their own pros and cons depending on your strategy. Below is a graph to visually explain the concepts. 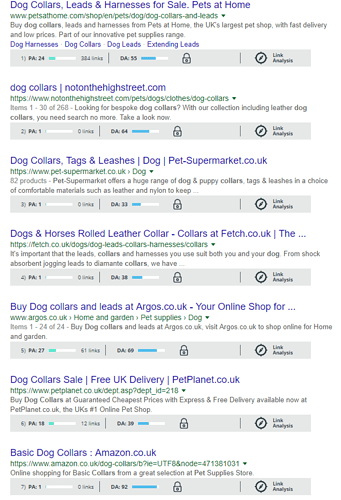 Generic keywords are unspecific terms that get search for, such as “dog collars”. Typically, you would avoid using keywords like this because results tend to be saturated in SERPs. We normally leave the big brands to fight for this because their high DA will always give them the upper-hand for organic results. Generic keywords also tend to be the most expensive keywords to bid for when it comes to Pay-Per-Click advertisements too. Unless you’ve got money to burn, then you need to think more about Broad and Long Tail Keywords. Generic Keywords also offer a low conversion rate, as these terms are generally searched for by people at the beginning of their sales journey. This could be if they are researching a product/service or window shopping. Broad Keywords should be the concept that you base your SEO campaigns around. An example of this could be “red dog collars”. This is where you catch the customer midways in their journey, as they start to narrow down their products. You won’t have to fight so hard with the big brands in the SERPs, and it should cost your less in Pay-Per-Click advertisements. 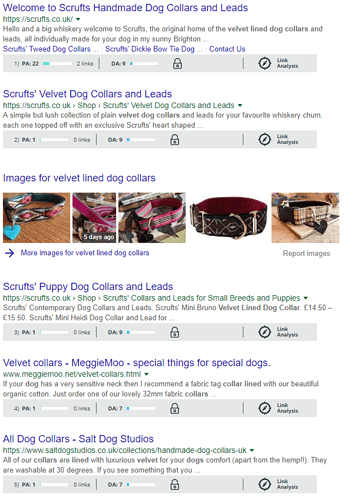 An example of a Long Tail Keyword is “velvet lined dog collars”. It adds specificity to the search term and captures customers that know exactly what they are after. 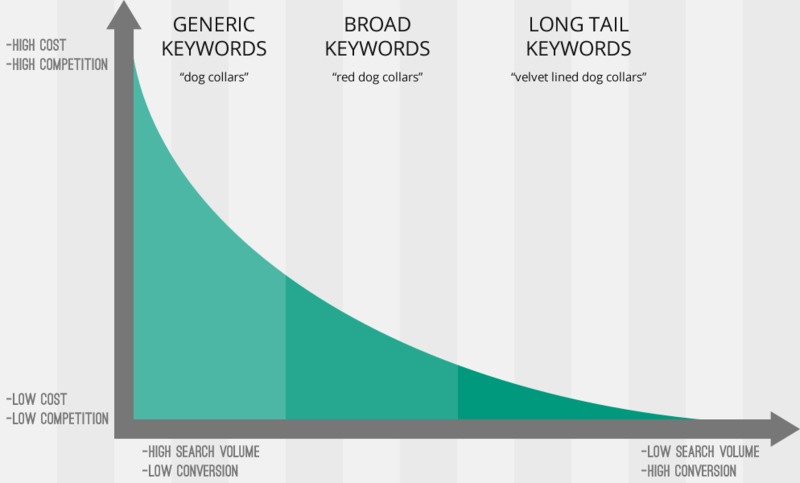 Although Long Tail Keywords have the lowest search volume, they yield the highest conversions. Targeting your products Long Tail Keywords to your niche audience is a balancing act and requires a lot of research. If you are too specific then you won’t get any search volume. Organically, this is the opportunity to rank above big brands. You will also pay much less for Pay-Per-Click advertisements. How do I rank above big brands like Amazon? Now that you understand the basic concepts of this article, I can clearly explain my case study where I show you how to easily rank above big brands. The first thing that I did was activate my MozBar App in Google Chrome. You can do this by clicking the ‘M’ icon in your Google Chrome until you see a bar load at the top of the screen like this. The bar may ask you to log in before displaying any results. 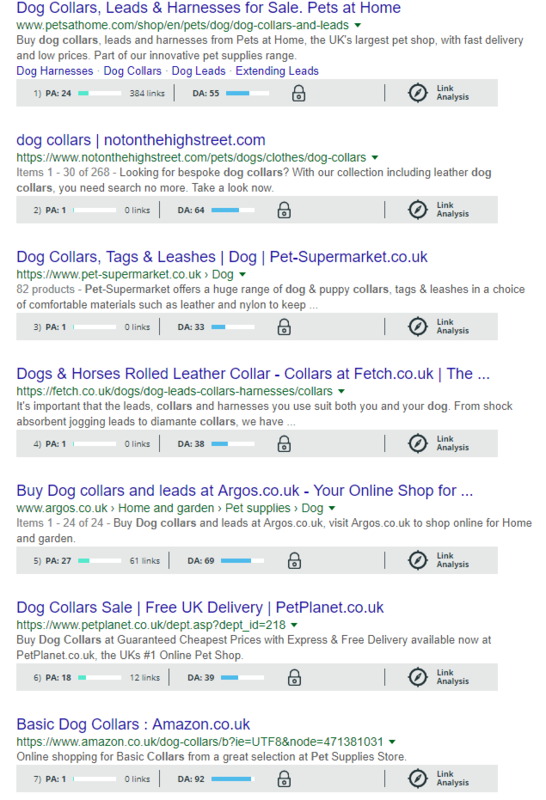 Next, I ran a Generic Keyword Search in Google for “Dog collars”. As you can see from the SERPs, all of the Organic Results are saturated by big brands with a high DA. The lowest DA that appears on the first page has a ranking of 33. My next search used a Long Tail Keyword Search for “Velvet lined dog collars”. As you can clearly see the results, the first page of SERPs is all smaller brand websites with a DA between 7-9! These types of searches can push the big brands off the first page and explain why knowing your customers and understanding the niche is critical in being successful . As an added bonus, you’ll also notice that the SERPs contain a handful of images that have also been optimised for Long Tail Search Results. Hopefully, I have been able to inspire you to concentrate on your Long Tail Keywords within your Category Pages, Product Pages, Blog Articles, etc… It’s not something that will make you money overnight, but it is an SEO Strategy that could make or break new online stores in the long-term. If you think this will help you, or you have experience with this strategy then I would love to see your comments below.